Rarely a day goes by without news about another deck of playing cards. More decks, more designs - will it ever end? Yet the market seems to be supporting the constant arrival of more custom playing cards. And so designers keep creating new decks, and consumers keep buying them. There is no doubt that we are living in an unparalleled age, where we are spoiled with an incredible richness and range of beautiful playing cards! But what are some of the factors that have contributed to the rapid growth of the custom playing card market? What has led to this state of affairs where buyers can have their choice from a wide range of stunning decks of playing cards, a range which is growing on a daily basis? In this article I'll attempt to shed some light on these questions by suggesting some factors that have contributed to the rise of the vibrant custom playing card industry as we know it today. I collect and review playing cards, and have also been involved with both card magic and cardistry for quite some time, and with the benefit of this experience, will share some insights on this fascinating development. A significant factor contributing to the glut of decks we are seeing in recent times is the arrival of Kickstarter crowdfunding around 2009. Prior to this, the world of custom playing cards was quite small, and largely dominated by publishing companies like Ellusionist and Theory11. Kickstarter has changed that, and helped cause the custom playing card industry to explode, so that today we live in an era where the market is flooded with all kinds of custom decks. How? Well, technology has reached a stage where the smart graphic designer can create a quality deck of playing cards from his desktop computer at home. Via digital communication, he can now partner with quality printing companies, harness the marketing power of crowdfunding via Kickstarter, and produce a lovely deck of playing cards. Suddenly, the little guy with a great idea can actually make it! Not only that, but crowdfunding also gives consumers new ways of discovering and accessing products that they like. Inevitably, it becomes a hothouse in which creators and consumers can meet, and delight in seeing yet another custom deck of cards become a reality. Another big factor in the rise of custom playing cards is the rapid emergence of cardistry as a legitimate and separate art-form. Card flourishing comes with a unique set of requirements. While this includes the high performance handling that magicians have always wanted, it adds to this the need for visuals that showcase the look of a deck of cards, and which rely on these good looks to in turn create the visual drama of performance. As a result, we're seeing large numbers of custom playing cards which are designed exclusively for cardistry, and new decks keep appearing all the time to meet the needs and wants of cardists. Perhaps the most well-known example here is the Virtuoso deck, which was arguably the world's first deck that was created specifically for card flourishing. An extreme example of this trend would be the School of Cardistry decks created by the New Deck Order, which have identical faces. Many of the decks produced by expert card flourishers Dan and Dave Buck under their "Art of Play" label would also fall into this category, as you can see from their range here. Cardists typically look for colourful or creative designs where visual aesthetics will emphasize their flourishing moves. And because they're constantly handling their cards, they're also constantly needing new decks! Another factor driving the growing market for custom playing cards is the collector. Some people just love the novelty of custom designs, and appreciate high end artwork and unique designs, and so they will purchase new playing cards simply for their beauty and uniqueness. It may seem odd to some, but some collectors will even keep these decks sealed in shrink-wrap, and never open them. Regardless of what you think about that, the reality is that collectors can never have enough, and this creates a demand that ensures that new designs will continue to find buyers. Proof of this can be seen in how popular designers like Robinson Jackson, Jody Eklund, Steve Minty, Lorenzo Gaggiotti (Stockholm17), Alex Chin, and others have a legion of loyal fans who will back their new designs almost immediately, and any Kickstarters these designers launch will almost always get funded with strong support. Collectors are also attracted by novelty and bling, so anything different or out-of-the-ordinary will usually get support as well. The general public outside of the world of magic will often get behind projects that fit this description as well, being happy to pick up a fun deck of custom cards that they can use for playing card games or even just as a novelty. Generally speaking, we are living in a time of affluence, and a lot of people have large amounts of disposable income. Not only are a lot of designs of custom playing cards hitting the market, but many cardists and magicians are in a position that they have money to spend beyond the needs of their day-to-day living costs. As a result, the cash is there to support this industry, to keep it going, and even to make it grow. When people have money to spend, dangle something new and shiny in front of them, and they'll buy it. Magic is constantly evolving, and that is true of the cards used by magicians as well. As the market is being flooded with custom playing cards, which are becoming increasingly available, often at an affordable cost, we are slowly seeing this influence the magic profession. Over the last decade, the internet has had a huge impact on the world of magic, because video technology makes it easy for us to see video trailers of products, and to see performances of other magicians. Given the wide choice of custom playing cards available, some magicians are starting to use custom playing cards in their professional work, and as tools of their trade. There was a time where it was seen as foolish to use a custom deck of cards instead of a standard Bicycle rider-back deck, because it would arouse suspicion that it was a trick deck. But that is changing, and with some magicians starting to use custom decks, and performing magic in online videos and trailers, it is becoming more normal for the rest of the world to start using custom decks for card magic as well, and the general public gets accustomed to seeing this too. I suspect that this trend will continue. Magicians do have unique needs, so the degree of customization cannot be too significant. The cards need to look easily recognizable and familiar, so it is important that they be functional, and not be customized in the way a cardistry deck is. But as long as the cards are very clear and functional, a custom deck can be used. A bonus result of this for magicians is that it becomes easier for them to get away with a customized marked deck, since people are becoming more accustomed to seeing a non-traditional deck in the hands of a magician, and something out-of-the-ordinary will not immediately arouse suspicion. Everyone likes to personalize their magic. That is important for your patter, your presentation, and your persona. It is only a small step to extend this to your props, including the playing cards you use. Again, as long as they are not customized to the point that they distract from your magic, playing cards can add small amounts of personality, style, and elegance to a performance. Even on a personal level, I find that it can be nice to change things up by playing around with a different deck of cards, just like you might choose a different pair of shoes or shirt depending on your mood or on how you want to look. For example, a luxurious looking tuck box can add a real sense of sophistication and class to what you are doing, and if this fits with your performance style, this might actually strengthen your professionalism. So your choice of deck can also depend on what you're doing, and whether you are going for a slick professional look in an intimate close-up setting, or a casual street magic approach. Different decks will suit different situations, and while one might demand a traditional Bicycle deck, another might be stronger when using a custom deck of cards. As with other things in life, it makes sense to pick the right tool for the job you need to do. As such, I do not see this development as a negative, because it adds potential for new ways to choose and use your playing cards. Some of us like variety in aesthetics, and since magic is at bottom an art form, art can take into consideration elements like the visuals. All card magicians need to replace their decks of playing cards on a regular basis, since cards do wear out, and lose the ability to spread and fan smoothly over time. 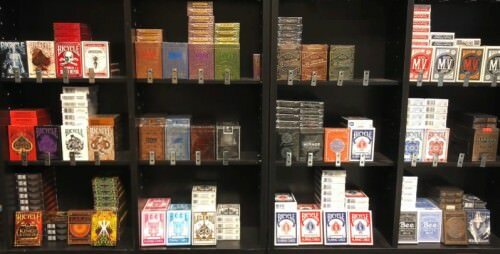 Both professional and amateur magicians alike will be buying playing cards no matter what - it is an inevitable reality of life that goes along with the trade. A deck of playing cards is simply not the kind of magic prop that you only buy once and then can use for the rest of your life, but it is by its nature a consumable. So there is a steady market of regular users who need new playing cards from time to time, and will be buying replacement products. This means that there is already a large and established market of those who are purchasing playing cards for conjuring use and card magic. Customized cards are just another way to meet this existing and ongoing need, and they give magicians a greater choice and variety to pick from. The makers of the Bicycle brand of playing cards, United States Playing Card Company (USPCC), has been around for a long time, and is certainly an industry giant with a wonderful reputation for quality. Their playing cards continue to have a monopoly type dominance in the playing card industry, and they have to be considered the main publisher of quality decks of cards, including those used for card magic. But times are changing, and with advances in technology, we are seeing other publishers stepping up, and in some cases even raising the bar. Smaller publishing companies like Expert Playing Card Company and Legends Playing Card Company operate out of Taiwan, and have mastered printing processes that equal and in some ways even exceed the quality of USPCC produced playing cards. They have super smooth edges and more consistent printing registration than USPCC decks, and are often packaged in more elaborate and lavish tuck boxes. As a result, custom playing cards are often of the highest quality, at a level that matches and rivals the big name USPCC competitor. The rise of this competition has led to quality products that in some cases makes these playing cards from other publishers a preferred option for buyers and magicians, given the superior handling qualities or look of the competition. Certainly this increased competition in the world or printing creates an environment in which the standards are raised, and the quality and number of products being produced really flourishes. It is an inevitable quality of human nature to want more things. We are good at buying more stuff - often things that we do not even need, just because it looks good, and we think it will make us happy. The word "covetousness" captures this well, and it refers to an inherent greed, an insatiable appetite that admires the next and newest thing, and enjoys acquiring new things. This is a quality that many of us share, and inevitably leads to a collector's mindset, where we see stunning decks of playing cards, and can hardly keep ourselves from buying them. It is not hard to see that this characteristic also contributes to supporting a custom playing card industry. Advancing technology not only has made the whole crowdfunding industry possible, but it also allows products to be produced with an unprecedented level of quality. The whole production process is reaching new heights of competency, and is able to accomplish things never seen before. As a result, printing companies are able to offer much more than a simple deck of cards. The cards themselves include previously unheard of features, like metallic inks, foil backs, and spot UV printing. Similarly the tuck boxes reach unprecedented heights of luxury and sophistication with the help of technology that includes embossing, foil accents, spot UV printing and more. All this combines to create a product of unparalleled beauty and quality. No wonder the market welcomes this, and buyers line up to support and purchase that brand new deck which offers a stunning look or feel that was previously an impossibility. Along with the technological advancement that allows playing cards of higher quality than ever before to be produced, is the reality that we are more and more connected as a global community. With a click of your mouse, you are able to see cards that have been created by designers all over the world, and can purchase them over the internet. Today we are connected in more ways than ever before, and that makes the playing card industry a worldwide one. This has positively impacted the production of playing cards, because demand for products has increased as the marketplace has opened up to buyers and sellers from around the world. We now can purchase amazing decks that otherwise we would not have known even existed! This process is accelerated as cardists and collectors share news and updates on social media, helping more people become aware of the great decks out there, thereby increasing the appetite for the hottest and newest decks that are appearing on the market. The potential for new types of playing cards is limited only by the human imagination; which is to say, the scope is almost boundless. Almost every week or month, someone is going to come up with a new or exciting idea that just has not been considered before, and that also applies to the world of playing cards. As a result, new designs are emerging into the marketplace which are clever, creative, and beautiful, in ways we have not seen before. It is safe to say that the level of quality and creativity is generally on the increase. Projects that would have easily funded on Kickstarter five years ago, simply will not make the grade today, because they're just not good enough. Part of this is due to the higher volume of playing cards that are entering the market, and a greater level of competition. But another factor is that the large range of playing cards that are being designed today corresponds to a greater number of decks that have a high level of inventiveness and originality, both from a technical and creative viewpoint. As a result, custom playing cards are appearing that are genuinely ingenious, stunning, or otherwise irresistibly attractive. No wonder it is then hard to resist purchasing them! All these factors combine to produce the ideal situation for creators of playing cards, knowing that there is a ready market just waiting to snap up the best creative and new designs that come along. It also produces the ideal scenario for collectors and buyers of custom playing cards: we are spoiled for choice! Join the discussion: What do you think about the fact that so many different decks of custom playing cards are being produced? Which factors contribute most to this? And is this a good or negative development? Interesting article! A project for playing cards that I supported on Kickstarter ended today. It was my first experience with a project from beginning to end and I have to say that most of the factors you point out in your article were at play. The interaction between people supporting the project came in the form of the comments posted and through those comments you could discover everyone's motivation for being there. Some were collectors, some retailers, some magicians, etc. Some were on a tight budget, some went over their budget. After a while the screen names became familiar and everyone rallied around to push for the next funding stretch goal. People from all over the world were able to support something together. Definitely felt like a team effort. The earliest I can remember of custom decks were with the Dan and Dave Smoke and Mirrors Box set. I feel like once those cards came out (and stopped printing) and people realized what you could sell them for on ebay it changed things. Especially since many of the custom decks are limited in quantity it makes it appealing since they are rare. I generally avoid premium decks. Nothing against them, some are quite nice. Arch Angels, for instance, handle like a dream but their price point puts me off so I end up using Bicycles or Tally-Hos. If Arch Angels dropped to the same price as standard Bikes, or even, say to a price point 20% higher, I would probably use them instead. The overall quality of Bicycles and Talley-Hos is good, and purchased in bulk they are relatively inexpensive. Where do you buy Tally-Ho's in bulk? I know about Costco for Bicycles, but are you doing something like Amazon or ebay? Where do you buy Tally-Ho's in bulk?